So we walk down to the main street and show up at the biggest and most prestigious-looking tourist operator in town. All tours have now gone, we’ll have to wait till the day after for another tour but my heart is set on a tour now. Committed to the plan we enquire about other options. A private tour perhaps? A very expensive private tour. We agree and an hour later we meet Maria-Teresa, an unassuming 50year old with short hair and the most fashionable blouse I have seen in a while. ‘Will we go to the eucalyptus forest?” I ask? “If you are interested in botany, I’ll show you something else” she says. 15minutes later we are at the heart of the CONAF headquarters. CONAF is responsible for the management of all Chilean parks and about 47% of the island is protected parkland. 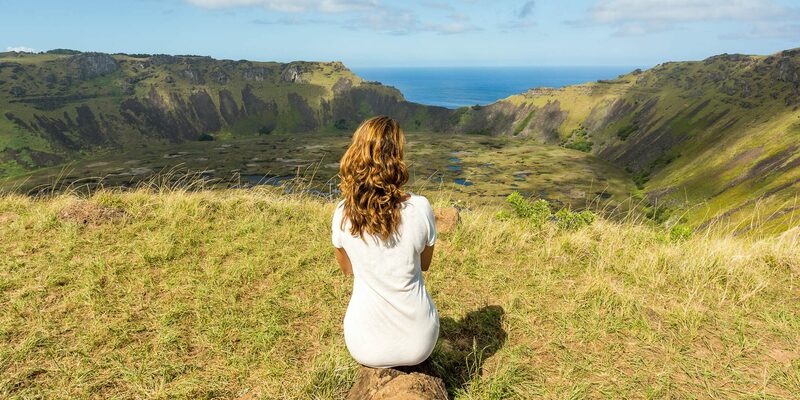 Given that the most widely held assumption as to why the Rapa Nui civilisation collapsed the re-forestation of the island is at the heart of conservation efforts. CONAF is breading hundreds of native trees and bushes as well as other Polynesian species which are not deemed invasive. Over the next 8 hours (yes 8 hours!!!) we explore only the south side of the island which is accessible by car. Soon we learn that Maria-Teresa is the sister of the archaeologist who led the most recent restoration work on the island and who has participated in most of the work across all archaeological sites on Rapa Nui. We discuss not only the history of the Rapa Nui people and their various religious festivities (from the moai all the way to the Birdman competition) but delve into life on the island today. The struggles of the local people who are ruled over by a government 4,000km away, the pros and cons of controlling the flow of tourists on the island much like is done in the Galapagos (there are now at least 300 people arriving on the island every day), the accepted and clearly evident use of marijuana even in public spaces. Around 7pm she drops us off at her favourite fish restaurant, our minds exploding with information and the colours of this beautiful island.